Phew, what a great weekend camping!! We kicked off our summer with a trip to Sandbanks Provincial Park. We picked up E early from school on his last day and hit the road (after stopping at the Beer Store/LCBO and Tim Hortons). We camped at Algonquin last year which is a much longer drive, and the trip to Sandbanks seemed like a breeze in comparison. Another change from last year is we have two car seats so less real estate in the car for all of our stuff. We thought we would need to buy a Thule Box for the top of the car, but we managed to fit it all in! We knew that Sandbanks was pretty wet and the forecast called for more rain practically the whole time we were there. When we pulled into our site, this was the road beyond us. You could drive through it, but it was still deep, and unfortunately our friends' site was in the midst of that puddle. This was the entrance to their site, not passable on foot, and the paths through the woods between our two sites were also flooded. They weren't planning to come until the next day but we texted them these pictures and warned them. We thought that if all else failed, we could make room for them on our site, but then it rained for most of the night and into the morning and the dry leftover portion of our site was less dry and in the end they decided to cancel their trip :( We were disappointed as we look forward to camping with them all year, and E loves to have his buddy along. Thank goodness I have these lovely rain boots. Not my best fashion statement when paired with woolly socks and shorts, but my feet were dry! So after we finally got the tend set up (it took us several attempts at putting it in the right location, first we were too close to the fire pit, then up on a hill so the front wouldn't lay flat, and then we finally got it), Dave and E went to get wood and ice, and I fed Q his supper. I think he really liked being outside so much. When we first got out of the car, he was really interested in looking around and I think he was intrigued by the tent. Q went to bed (fairly well but did wake up a few times on the first night), and we made our campfire nachos. I love nachos anyway but when you add the extra flavour from cooking over the fire, they are even better! As I said above, it rained a bit in the evening and then poured overnight. I didn't have a great night's sleep, worried about the rain, how Q was sleeping, how the weekend would go, etc. It was fun to play in the tent the next morning with these guys in their matching PJs. After breakfast, cereal, fruit, muffins, and coffee in our new French press coffee maker (mmm), we headed back to the tent. It rained for a few hours. Dave had a phone call for work that he took from the car, Q napped, and E and I played cards (while I constantly checked the weather, and texted with our friends as they decided not to come). After Dave's call, we struck out to explore. The rain had mostly stopped by this point, but there was still a lot of water around. I didn't really plan it, but I'm glad I picked up these big rubber boots for E before camping. They are from Wal-Mart and are super sturdy. This is the day use beach and the water level is much higher than normal. Then the sun peaked through so I tried to take a picture of it since we weren't sure if we would see it again. Note the bungee cord belt, he wore this for most of the weekend. After our walk, we went back to our campsite and we made grilled ham and swiss sandwiches on croissants, a first time making these but they will be put into the camping rotation, very tasty. The rain seemed to be over for the day so we headed to the beach. This year we were in a different section of the Outlet campground. We could have walked to the beach, but we decided to drive instead, our site was just that much farther than we've had in years past. Q's first time on the beach. He was in Jamaica of course, but he was too young to sit in the sand then. He tried to eat a few handfuls of sand but we could usually stop that if he had his soother. It turned out to be such a beautiful afternoon and we couldn't believe it, so different from what we expected. I forgot my bathing suit so I was forced to watch the action from the shore, but whatever. Dave took Q into the water to wash the sand off of him and then Q fell asleep for an hour or so in his stroller. It was my turn to go for wood and ice after we got back. On the way to the woodlot I saw this turtle in the road. Last weekend at Bioblitz we learned that it is not illegal to help a turtle across the road, and you should help. So I stopped, scooped him/her up, took him/her in the same direction he/she was headed, and let him/her go (and of course took a photo). I got these stainless steel wine glasses for Christmas and I finally broke one out on Friday night. Love drinking wine at the campsite. We had cheese burgers and salad for supper. Q snacked on some mini pitas before we ate. I had put together a few games for E and his friend to play. This one is an alphabet scavenger hunt. Find something that goes with every letter of the alphabet. This is E working on it while I made supper. I wrote in a few of them, but he did the rest (with spelling help of course). After supper we tried a new campfire snack, cinnamon rolls. I had bought a roll of Pillsbury cinnamon roll dough. The recipe I had seen on Pinterest called for crescent roll dough that you could wrap around a stick to cook, like bannock, over the fire. I thought the cinnamon roll dough would be similar, but instead we cooked them on the grilled cheese sandwich maker we have. It took several attempts (the first burnt batch is at the top of the photo), but we figured it out eventually. A nice little treat and something different from s'mores. The next morning it was Canada Day! We had a little rain in the morning but not too much. We had pancakes and sausages for breakfast. Love this guy and his new beard! Another game, a Colour Scavenger Hunt. Match things you find with the colours on the paper. E did really well with this one too. We grabbed our third scavenger hunt and headed out for a little walk. This hunt included things like "Find something to: jump over, crawl under, play catch with, etc.". We had beans for lunch (with leftover sausages chopped up in them) which was something new. The park was giving cans of beans away when we checked in, and they were really good. I joked that it was their attempt at diverting our attention from the flooded sites and small beach. When I was asking the park attendant how the park looked in terms of water, he interrupted me to see if I wanted any beans, and then I forgot about asking about the water and drove away with my free food. Well played Sandbanks. The weather was beautiful in the afternoon and we went back to the beach. Q played in the sand, got dirty, went for a little swim, and then fell asleep in his stroller for over an hour. The forecast was calling for some pretty heavy thunderstorms to roll through around 6:30 so we left the beach around 4:00. Our little Canada Day photo shoot (some better than others). Who let the five year old use the ax? After supper we enjoyed our other new campfire treat - sugar cones filled chocolate chips, mini marshmallows, skor bits, and for Canada Day, red and white M and Ms. On our first night we also cut up strawberries, you could do bananas, raspberries or apples too. Then you wrap them in foil and warm them over the fire or in the coals if you're brave. This was a good little thing that E could make himself, with some tin foil help. The predicted thunderstorms never came through the campground so aside from a few sprinkles, we remained dry. We woke up to a beautiful day so we had a quick breakfast, did a little organizing and then went to the beach. I wasn't sure how these photos would turn out since it was to bright to see my screen, but they were good. It was really breezy so Dave and E had a good time jumping in the waves (they are the ones with the noodles). We kept Q out of the sand and water this time, he didn't care. Then we packed everything up and headed out. A miracle that we had a dry tent to roll up. There is a mini-putt course outside of the Sandbanks gates so we went there for lunch and a round of mini-putt. Dave shares his ice cream, Q looks like he doesn't like it in this photo, but really it was because it was cold. We got home at 7:00 pm with just one stop on the way to give Q his supper. We ordered pizza, had baths/showers, and unpacked the car. It didn't start out well, but the camping trip was a success in the end. 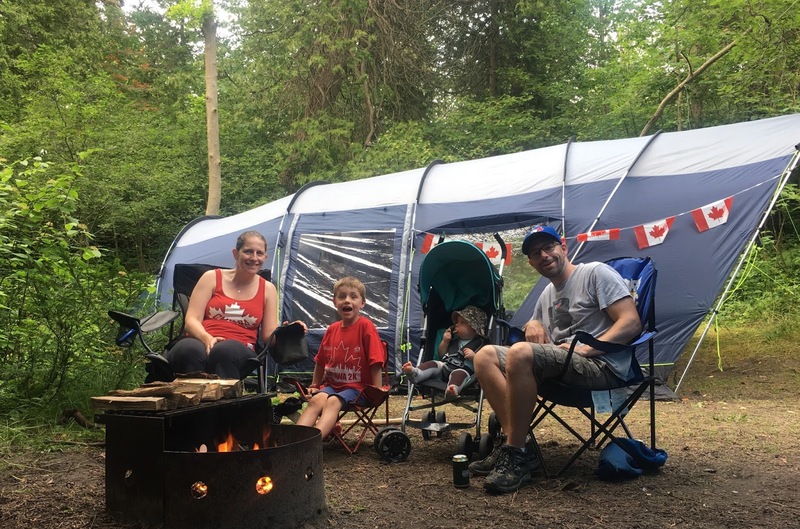 We love being able to enjoy Canada Day in the great outdoors! What a wonderful Canada Day weekend! You sure know how to do it! Loved all the photos!